EQ2Wire is providing a running transcript of today’s EQ2Insider Developer Q&A with questions posed by players on the EQ2 Forums, Facebook, Twitter, and even Google Plus. Present on the panel are EQ2 Community Manager Margaret “Luperza” Krohn, EQ2 Producer Holly “Windstalker” Longdale, EQ2 Game Designer Mike “Xelgad” Ganz, and EQ2 Lead Designer Kyle “Kander” Vallee. 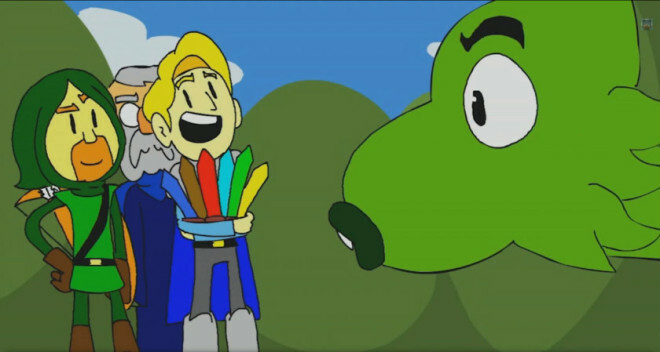 Today’s livecast started with a hilarious 2D animation of the Age’s End story thus far. Announcing the winners of the EQ2 summer contest. DISCLAIMER! Q&A is one of the hardest things to transcribe so please consider huge leeway in my transcriptions below. Any errors in transcription are my own. Q: Would it be possible to use Blessing of Xegony as an appearance mount item so that we can use our wings when we are on a flying mount? Q: Would you ever consider adding “Yelnar’s Research Prism” to a vendor? A: No plans at this time to change this or put them on StationCash. Q: Any chance we can get a Nek, Charm, or Lightning Appearance Slot? A: Unlikely. This would take a lot of work. We’d have to “split” so many things. Q: Would it be possible to have Armatal’s Ringmail Purse only show the pink circle to the group it’s active on as it only affects your group and not the raid? A: This would take major resources away and take a lot of development effort. This is probably not going to happen. Q: Will WIS ever be reworked so it is used by your healing abilities? A: This would require so many changes. It would be unreal and take a ton of time to do, a major game change. Currently, damage dealing is part of the gameplay for healers, so the primary attribute is still important. Q: Could we get a channel for Guides and Events? A: This is something we could do. It’s possible. Q: Will there be a new currency intyroduced in order to consolidate some of the plat that some players have? For instance: Ethereal items are selling for 15-20K plat on AB. It’d be great if they could be listed above 9,999p. A: We are looking at the possibilities of eliminating copper, or adding mithril, or raising the limit for broker listings over 9,999p. Something we might actually do next year. Our code list for the expansion is a pretty vast pile, so it likely won’t happen before the expansion. Q: Can we have more ways to organize our banks, perhaps added tabs? A: We’ve been talking about adding some more tabs. Nothing set in stone. We’ve been discussing ways to add more room and stuff for organization. It’s on the list. Q: Will we ever see more guide events and rewards added? A: Sure. If the Guide team want more items, they should contact us through senior guides. Q: Will we ever have in-game voting for features and specific development resources like PlanetSide 2 has adopted? Margaret: Actually Planetside 2 is moving away from the surveys and going back to forums and development roadmaps. Q: Will we see more Census data being added in the future for things like Quests, NPCs, Zones, Collections, AA Named lists, Leaderboards, and Loot Drops? A: We’re all hands on deck for the expansion but we know how interested Feldon (and others) are! Q: In the future, when running a quest for the latest quested accessories, could we see the quest award not 1 ring, wrist, or earring, but pairs of them? A: We only have a limited number of slots we can produce quests for, so we probably won’t do matching sets. Q: Can we have daily +2000 faction quests for Bathezid’s Watch, Riliss, and Danak? A: It’s time consuming and not on the immediate priority but we’re looking at the possibility of faction potions. For the future, we’ve pretty much stopped using factions. They’re not super popular and they are pretty grindy. We’re making a concerted effort to not make things grindy. We’re thinking about some faction things for expansion 12 (yes, 2015). Q: Would you ever consider changing rarity loot cards so that they are no longer attuneable or no-trade? A: In the future? Maybe. No current plants. Q: Will we see any changes coming for Conjuror pets in the future? Xelgad: Conjuror pets are a sore subject around the office. Mage pets are probably fine. I want to rewrite the AI for summoner pets. It’s one of the highest items on my “I want to do this” list. But hopefully in the next year it will be something I can get to. Q: Will you ever consider removing the level 95 restriction on the 350AAs? A: No. It’s a balance issue. We want to give you a benefit to being level 95. There’s a reason why we did the 280AA limit as well. We want to be able to balance content based on player power. Q: Would you ever consider changing Conjuror/Summoner pets so that they share stats with gear and AA lines? Q: Are you looking into ways to make it easier to tell what stats our pets are sharing and what stats they are not sharing with our characters? A: They currently share many stats. We don’t currently plan to change which stats are shared, but we want to do some user interface changes so you can more easily tell what’s shared. We recently changed which stats are shared and are currently happy with the balance here. We would like for you to be able to see your pet stats easier. Q: Will you ever make Petamorph Wands that persist through death? A: This is actually a much more time-consuming process than people realize. We’d have to change the base functionality from the ground up and redesign every petamorph wand to support this. Just making summoner pets persist was a huge undertaking due to our systems. Q: Will tinkered items ever be stackable? A: Yes probably in early 2015. Q: Can you consider making Etyma convertible into the new currency? A: No because people would stockpile for the expac. Q: Have you ever considered reducing the recast on Bloodletter? What was the reasoning for making the recast time the way it is? A: Not to say nothing will ever change, but we don’t think the current recast is excessive. (Kander: I have a really cool idea for Bloodletter maybe for a future prestige ability). Q: Will you ever make Character Slots, Mercs, and the Research Assistants giftable items? A: Yeah we’ll look into it. Q: Would you consider allowing Mark of Awakened as an appearance items? Kyle: Maybe we could come up with a bauble or some way if you have completed the quest. Holly: (my poor phrasing here) We have to be careful about getting distracted with things like this and making sure we’ve got our priorities in the right place. Q: Will Erollisi Marr ever be a worshipable deity? Kander: We have a proposed deity revamp idea. It’s a plausible thing. We’re thinking about doing it next year maybe summertime or maybe the next expansion. Part of the plan is to make Erollisi worshipable. If we do such a revamp, we’ll add her. She’s on the absolute top of our list. Q: High end raid zones are experiencing some lag, specifically Mutagenic Outcast and Dreadcutter. Is there any way we can help? A: We have some changes coming up in the near future which may help with performance. Mutagenic Outcast has an issue with the number of adds, which are reducing soon. We’ll try to never do something like Dreadcutter again because of the lag issues. There are so many things that contribute to latency. We’re working on it. The code side has been making changes on the back end which are improving performance. Q: How do you feel the changes implemented for Tanking/Healing in this expansion have worked or not worked? Are you looking into more changes in the future regarding these? Q: Would it be plausible to have an appearance tab to have an area for us to store all our appearance gear? A: We actually have a document for a Wardrobe idea. It’s something we’d like to do. We’ve talked about it with code. It’s just finding a place to fit it. This expansion we’re doing a lot with itemization and balance so there’s not a lot of time for some of these other things. Q: Will skeleton and other illusions ever stay on while we’re on a mount or in a mounted zone? A: We thought we fixed this! We were working on a fix for this so that more illusions would be maintained while mounted. (Ttobey in chat): I got it done on my end! Q: Would you ever consider removing NO-VALUE/NO-TRADE tags from looted equipment, moving away from Heirloom only Lore-Equip items? A: Generally NO-VALUE has a good reason for it. Q: Could we get a separate tab for all illusion items? A: We probably won’t add a separate tab. We just added 66 slot bags. Q: Are sailable ships and ocean expansion something we’ll see in the future? Q: Will we see more in-game polling? People don’t come to the forums. A: We discuss in-game polls all the time. We’ll see if we can do more of them. Q: Any plans to make PvP-centric mastercrafted gear? A: There will mastercrafted gear that works in PvP, but not PvP-specific mastercrafted. Q: What can we expect to see in the future regarding PvP? A: We have a new battleground coming in Roehn Theer’s platform. 6v6 deathmatch. The platforms don’t drop, but there’s a reason to be standing in different places. The battleground will change dynamically. It uses the same floor layout as the Challenge Duo zone. A: Currently nothing on the schedule or specific plans right this second. We could do some new ones in the future. They’re not incredibly hard to implement. The first one was, but now we can add more. Q: Will jewelry and weapons ever have a cannibalizer option? A: If you mean sacrificing health and power? Perhaps. If you mean a transmuting system? Perhaps! Q: Will we ever see any changes to how fame works, making it harder to stay at Overlord/Warlord? A: We recently changed this, so we don’t have any plans at this point. Q: Will we see new spells and combat arts when we level up to 100? A: You will see the upgrades but we won’t have new abilities. Those will be in the Prestige trees. 25 more points in a new tab. We’d rather give you options than give to all. Q: Can we get Dungeon Maker spawners? Q: Will you keep the gem system for armor? A: We like the gem upgrade system so we intend to keep using them in the expac. Q: Can we see more in the ways of MC Fabled armor? Though I am a raider I play all aspects of the game. Q: Can tanks expect to keep seeing the proc on avoid procs on gear in the next expansion? A: These effects give us fun ways to add tank-specific effects. We like these alot. Q: Will we ever get triangular, spherical, etc. building blocks? Q: Will you ever consider upgrading adorning recipes to go from lower to higher? A: (rough) We’re talking about something for the future. Q: Would it be possible to add a search option to Moving Crates? A: It’s a good idea and something we should add to our “bucket of awesome” but no current plans. Q: With the level increase in the expansion, will tradeskill level be increased to 100 t0o? Q: Will you ever add a portal to transport from one guild hall to another to support guild alliances? A: There will be items that are craftable that are comparable to raid gear in the next expansion. Q: Will experimentation grow beyond crafted items? A: After the expansion is, we want to spend a little time looking more at Dungeon Maker to see if we could add things to it. We’ll be talking to decorators and dungeon makers in the community to see what we can do here. We know it’s pretty broken. We didn’t completely abandon it but at this point we’re not quite sure what to do with it. Q: Could we get an AA system for Guild Halls to add really cool features? A: We’ll probably add new amenities with the guild level 100, but not AAs. Q: Will there be more ways to get purple adornments (war runes)? A: There will be more ways, but they probably won’t be on a vendor. There are a lot of complaints about how tedious they are. I know a lot of people really liked the Destiny of Velious system of unlocking war runes on a vendor. That’s not really possible to repeat for the expansion, but we have some ideas for purple adornments which we’ll be revealing at SOE Live. Q: Will there be any free housing items and free house items in the future? Kander: We’ll always add stuff to the existing systems like house items through content. Margaret: I think he meant without StationCash. A: We always add in-game rewards for houses that don’t cost SC. A: This is a major “we all want it” feature but it’s a huge undertaking. Q: Would you ever consider selling recipes on the Marketplace? A: We might consider it. It’s content. We’d rather give it to you playing the game. We had a chance to sell the recipes to make House Actors and we opted against it. A: Not at this time. Sometimes when we add new areas, the art team will make stuff that fits the area, but most of the crafting stations are pretty benign and fit anywhere. You know what it is on first glance. Q: Can crafted gear be a step above crafted gear? A: There will be crafted gear that’s really good. Q: Can we raise the limit for teleportation pads from 4 to 8? A: We don’t necessarily want to add a ton of new guild hall amenities, but improve the existing ones. Q: Increase house and guild item counts? A: Houses and Guilds with a large item count are a huge performance issue for our players. We have no plans to increase raw item counts. We recently allowed you to have more building blocks that don’t count against your house limit. Houses are a performance nightmare. We always want to give you more room to add more stuff, but it’s easy for a decorator to place a lot of items and crash their own or other’s computers. Q: Can you add Petamorph wands to Conjuror and Necromancer trainer vendors? A: Not with Petamorph, but we’re looking at a system where you could either store appearances or right-click on your pet and change the appearance to another stored appearance. Double Etyma Extended through July and Double XP Weekend! Windstalker: Double Etyma is extended through the end of July. Windstalker: This weekend starting at noon on 7/11 through Sunday night, we’re going to have Double XP. Margaret: All Access means you get Double Double Etyma through the end of July. Windstalker: We might do Double Guild XP the weekend after next. It may be just me, but I was taken aback by the designers’ attitudes in answering questions. They seemed very condescending to some people asking certain questions. They just didn’t want to be there. The guys looked tired, and/or stoned. When you cut a development team from 40 to 25 and take all the all star coders and move them to Landmark to get the alpha/beta out the door, yeah, it really cuts back what the team can do. If the team got back up to 35 or so, we would see more of these “can we have x?” questions get a positive answer. Feldon is right to some extent. Live game teams are much smaller than game teans that are still in pre-launch development. You guys are right. I sincerely apologize for that and hope I didn’t offend. I’ll have a chat with them regarding the “condescending” tone/facial expressions. They don’t mean to come off that way. Kyle and Michael care A TON about EQ2 and play a lot in their off time. None of them are really camera trained other than Holly, slightly. I didn’t mean to be destructive in my comments. I probably should’ve put that out there in a better manner. I apologize. I spoke out of emotion after the Q&A was over as I got a negative vibe was all. I will re-word my toughts better in the future. Oh for sure! I understand. Most people are just super passionate and emotional when they write things, so I just read between the lines and figure out what their main complaint, argument, suggestion, etc is. I don’t think its camera training that was the issue here, it was the manner in which the answers were given. It’s the usual conundrum that you get some technically gifted people that should be kept as far away from public/customer facing roles as possible as they don’t interact well (or come across as caring). This normally is because they assume the questioner should have the same base level of knowledge as they currently have. Lets be clear, it is fine for the devs to say No. However it needs to be “No, because…” rather than just plain no (unless the thing being asked for is completely outlandish). Holly was clearly frustrated at the start with the way the initial responses were being given and practically had to force Michael to explain why he was saying no. It settled down after that but the tone for the Q&A session was then set as being fairly negative from the outset. The previous Q&A session with Kyle and Akil contained probably as many “No” answers but didn’t come across as anywhere near as pessimistic as the answers were (mostly) given with suitable reasons/qualifications, enthusiasm, grace and good humour. That is what you were missing this time, not camera-training. One of the things that I took away from this episode that at least the devs were honest and didn’t try to palm us off with a bunch of ‘yeah maybe we can look at that’. Its also apparent that EQ2 is a behemoth of a game in terms of code, and quite probably archaic and maybe even anarchic somewhat under the bonnet, when you consider that the game is close to 12/13 years old if you count the development time prior to release, tech has evolved greatly during that time, a lot of programmers have come and gone, and the inner workings of the game quite probably simply haven’t been able to keep up. So adding / changing things that we might all consider a tiny update, probably take much more effort. I do think that perhaps a mixture of devs like Akil, Kyle, Xelgad should be on-hand for answering tech questions, but maybe on the sofa to bounce to, as its clear they must feel like fish out of water being on camera. I couldn’t do it, and certainly wouldn’t want to do it, and I can imagine its the same for some of them. I hate to say it but even Holly looks uncomfortable with it all sometimes and like she would rather be anywhere else in the world than there. The vibe is noticeably awkward sometimes and a wee bit on the negative side – which is quite the stark contrast from the Landmark livestreams and its sad to see, imho EQ2 is a title SOE should be championing and singing from the rooftops about. Personally I think you should have Kaitheel facing camera with Maggie, or someone like him. Kaitheel always comes across as vibrant, positive and upbeat, slightly on the nervy side maybe, but entirely understandable. At the end of the day the show is undeniably a marketing tool, so it needs front of house people. Drag in Omeed for a show even though he probably knows zero about EQ2 lol, he might help warm things up a little bit. Also another little tip is maybe run through the Q & A’s in advance of the show with the devs and weed out a chunk of the ones with a flat-out ‘No’ as an answer, so the focus is predominantly on answers that something can be done about, or something is being done about or will be done about. That’s not to say don’t give honest answers, and don’t throw in some answers that are a flat-out “no can do”, but the vast majority of answers did seem to be a flat-out no, and almost derisory at times and I don’t think it meant to come across that way. Doing this might lead to a more positive upbeat vibe about the show. 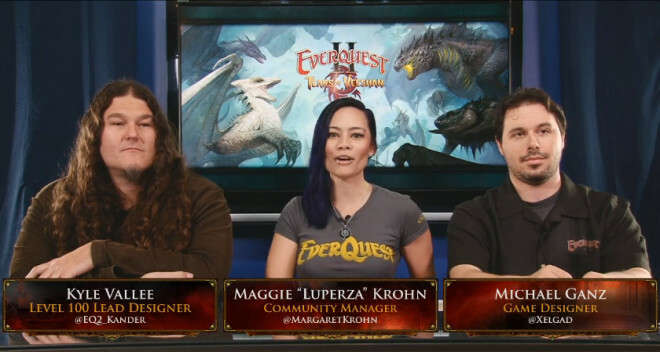 Just my 2 coppers worth, either way I’m really pleased there is a show for EQ2 and for Maggies efforts in making that happen, as well as the ‘fish out of water’ devs for stepping up to the plate and getting in front of camera, the show just needs an injection of some upbeat front of house positivity. Nothing that can’t be fixed up I’m sure. Thanks for writing this up Feldon. “Is [feature request] somewhere on your obviously overloaded priority list?” The answer to this is sometimes yes, but not when your favorite feature request is dumb. The smirk is typically deserved. The worst were the ones tagged with “I’d even pay SC for this,” which is just a lame attempt to assign undeserved importance to your favorite feature request. It’s also fairly insulting, as it insinuates that they’re only interested in providing content that will rake in the big bucks. The only real “Q&A” question that I remember came from Errrrrrorrrr, who asked how they would evaluate the current tanking/healing dynamic. Virtually everything else was just feature-begging. These were all questions players asked in the thread. I just compiled them. Just to be clear, your efforts are not being criticized here. We appreciate the opportunity, even if we squander it. =P I’m doing what I can. I’m just glad the team is willing to work with me. I can be demanding sometimes. Haha. I hope that’s not your hair color or I am going to give you the longest depressed sigh next time I see you. Your favorite color is cookie. That’s a color? Crayola got desperate. 4) Since when did we ‘have to’ speculate/predict what their future plans are, before preparing our questions? Some of us want server merges, have you seen guk lately. That is the only question I want answered as to when its going to happen. We have no plans of making any server mergers as of right now. 1) when you open a bank window it should open your bags, not your character window. 2) the GH Harvest depot should default to common, not all. 3) the GH house portal should have a way to remove other peoples homes (I have several that made me friends/trustee that haven’t played in over a year) from the list. Or at least have a separate tab for homes that are not yours. 4) the GH harvester/gatherer amenities should be consolidated into one. Edoo, the only problem with #4 is that the guild doesn’t always run out of the same levels of materials at the same time. The gatherer / harvester bots in my guild are usually out getting different tiers of metals, wood, etc., because a guy was using the tier 7 metals to get weaponsmithing up, another guy was using tier 5 foods and a woman was doing tier 3 tailoring. We appreciate being able to get different levels from each bot. A lot of the questions were reworded so in fact answered somewhat incorrectly. Like I asked if all gear stats can be shared with the summoner pets not just what SOE wants to be shared with pets(including dumbfire pets). I already know they fixed some of the gear stats to share why does not all of it? Then I asked if AA lines were going to be basically fixed for summoners, like the useless healer pet removed, and other stuff not used or stuff broken. This wasnt even answered. Then I asked if an interface can be put in to show what stats on gear are actually sharing with summoner pets(dumbfire and main pet), because right now its like you have to be a rocket scientist to know what does or dont. If everything on the gear shared then there would be no guessing right and no interface to this effect needed. Also, Tabri worded her/his questions differently than this last time, so it was a little ambiguous and I tried to translate it into a one sentence/constructively worded questions the best I could. No this is not how I asked it on the forum I rewrote it here to explain it better, I wish I would have but then it probably would have been skpped due to length. On the forum I made it short because like they said dont want entire paragraphs it was supposed to just be short questions. This was how I wrote it.
. Fix conjurer/summoner pet sharing stats with gear and also AA lines? Or at least make it easier for us to tell what the heck is sharing and with what pets. Yeah, putting a question mark behind a statement does not make it a question. =P Hehe. What SOE wants- Is there someone else I dont know about that wants to make random gear stats share with pets instead of all gear stats share like they should in EQII? What do you suggest be written? Please reword it improperly when you rewrite it. Analogy- you have to be a rocket scientist(which of course is an exaggeration) this clearly explains how one has to figure out stats on a summoner in this game. I personally think that will get across as, way to complicated. Please what would you suggest Deth that would be so much better? I once read that tact was the ability to tell someone to go to hell in such a way that they anticipate the trip. It’s all in the wording. Are there better words to use than “fix, useless, and broken”? Yes. Even if things are broken, useless or need fixed, using those words in your question is just going to put the person being asked on the defensive. The same question/idea can be presented in many different ways with drastically different results. Today, some gear stats are shared with summoner pets. Are there any plans to expand this to all gear stats? Are there any plans to do a re-look at the summoner AA lines? Some of the choices like the hydromancer pet don’t appear to do what their descriptions say they should. Could something be done to make it easier to see which stats on gear are being shared with summoner pets (dumbfire and main pet)? Thank you so much for the transcription, Feldon. With fear of sounding like a Fanboi, I really liked this session. Xelgad answered honestly and I appreciate that. I like the fact someone asked about the broker list prices. This has frustrated me since ethereals came out. This Q&A was great I leaned two things from it. 2. They are strapped for work at the moment. I can assume that they WILL NOT make all gear stats work with summoner pets though out of this Q&A because they said this “we like how it is balanced at the moment”. So I will probably not ever ask this again. It would take too much work to allow us to have every single thing share, which would require them to balance sorcerers even more so, this is just my assumption. That leaves the fact also that they do not need to make any kind of interface for summoners to see pet stats, we can already do that with possess minion anyway. What needs to be done in this case is just put something the gear itself whether things share or not, a tag for example. This might be the easiest solution. I might just put this in the next Q&A as a suggestion or forum then. Maybe the community should learn to write open ended journalistic probing questions. Lupeza might screen ones that are too good, but wow at the crappy questions. It’s like a really bad Mad Libs; I think Kong captured the brunt of it. Reading the quality of questions actually makes me dread some panels at SOE live. I try to self moderate questions a little, and dumb ones make it out on occasion. Anyone who doesn’t understand the smirks is either really dumb or really ignorant (or new). If you’re really want to know ask of the answers to what features you can or can’t have in the near future maybe dig Holly to be less ambiguous about the roadmap. If you ask nice she may allow sometime like Lapeza to maintain a near and medium term roadmap and bug priority list. How about a good article on how to ask good interview questions, Feldon? It could improve the panel experience at FF. Maybe do it a week or two before Vegas. It could even cover basic panel etiquette for folks that need it (like the incredibly rude and aggro lady who asks the same battery of questions from atop her mobility cart every year in multiple panels). Almost forgot: thanks for the transcript Feldon. I know they take a lot of work. And before someone who deals in absolutes goes into a rant, I didn’t say all questions were horribly posed, just the vast majority. Fewer high quality questions = more time for better answers. People were invited to ask any question they like. If people wanted to know what color Holly’s socks were, they could have asked that. XD Good grief. XD What is with the “OMG, you people are so stupid” attitude some people have? XD Sounds like a personal problem. I’ll just reiterate that these were the Lead Designer and Lead Mechanics guys. They do dungeons. They do raids. They do spells, AAs, Prestige lines. I guess if all the questions are going to be about crafting and furniture, then Kyle and Mike could go have a coffee and we could get in the devs that do that stuff. The reason they received questions including fun ones like I put regarding the Mark of Awakening (which started everyone agreeing with me) is because I did not see nor did anyone else see anywhere in the forum thread where they wanted specific questions asked. Actually this is what they said in the forum to get people to ask questions. We’re going to be answering your questions LIVE! Ask about anything! Agreed. They should specify what type of questions that staff will best be able to answer. Aye. /..\ I thought with all the time they had to compile the questions, they’d at least cherry pick a bunch they could say yes to, for PR/player morale purposes. Is it possible to penalize sellers on the broker if they don’t place the sales crates and not paying the house rent? Buyers are forced to pay commission fees because people don’t pay rent/place crates. If you want to receive full price allow people to come to your home. It’s up to you to penalize them, by not buying from them. Mail em? =P I’ve done that a few times, and they paid the rent when I logged in the next day, or if they were online they’ve gone and opened the house when they were done with what they were doing. You know in all honesty I think the team did a great job, and especially Luperza who is not only handling all that she does in the office but also on the forums and then on top of all that takes the time to come to the fan sites and answer almost every person individually!!!! Wow, I’m impressed. as for the guys and getting them in front of the camera that is easy, as simple as three words…. I sincerely appreciate the effort that has been given recently to be more open with the players and have that open book policy to allow us to see the changes and let us know what is coming etc.. It still needs improvement but it’s getting better so thank you team.